Restoration of one of only two family autobiographies, the other’s location is unknown. The title was then inset, preserving the original gilding and restoring. Book boards were added to the front in back, applied as a GoatSkin case binding. Hunter works to restore and repair books for preservation that will last another few generations. His rebinding include leather recovering and spine repair jobs to full rebinding and restoration on handed down leather bound books. From 18th century leather bound volumes through early and late 19th century leather and cloth covered bindings, all the way to modern bindings that have just been over worn. 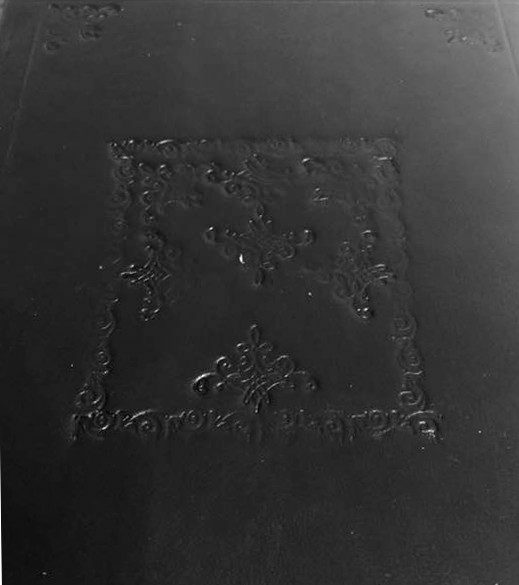 Below is another goatskin case binding of a modern pocket bible which suffered from heavy use. Hunter has made many a book, large and small. Custom orders, journals as gifts, tooled and plain. This includes recovering and rebinding modern books for a classic look as a gift, to authentic reproduction historical texts. Authentic handmade books are created using cotton laid paper, hemp or linen rope, and wheat paste with animal glue to bind the book, which is then covered in goat or calfskin leather. Brass tools are heated to gild or “blind tool” the leather. Plain, marbled, or paste paper end papers are possible, as are bindings made with less expensive modern materials. A journal, two tone goatskins leather with raised cross. A full covered set of the Harry Potter series, made to look in the style of an early rough binding, with blind tooling. A gift of larger ledger style books, un-tooled.